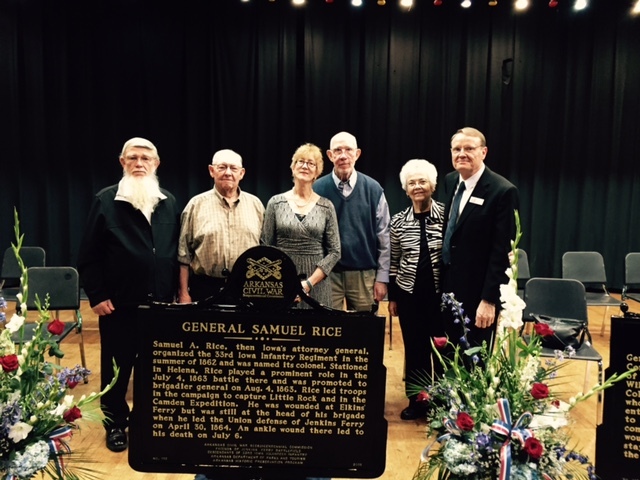 Five descendants of commanding generals Samuel Rice of Iowa and E. Kirby Smith of Florida, at the Battle of Jenkins' Ferry attended the dedication ceremonies of seven historical markers at Sheridan High School at the invitation of Roy Wilson, GT/AP Coordinator, project director. Picture cutline: (l-r) Bob Kennedy and John Kennedy of Iowa; Maria Kirby-Smith of South Carolina; Dr. Richard Kennedy and Martha Kennedy Hahn of Iowa, and Roy Wilson. The seven markers are currently on display this week in the SHS Library and are scheduled to be displayed at the SJHS campus next week.